Are you paying quarterly taxes this year? Don’t worry. You’re in good company. 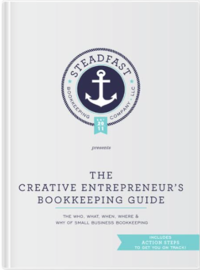 Although it’s common, maybe you’re new to paying quarterly taxes–and all the other responsibilities that come with being a creative entrepreneur. So, in this article, we’ll cover the basics of paying quarterly taxes (including who does it) and provide you with examples of taxable income. First, who pays quarterly taxes and why? When you’re employed, an employer withholds Social Security taxes, Medicare taxes, and income taxes for you. But, when you’re a freelancer or self-employed, things work differently. Your clients aren’t required to withhold taxes. You invoice your client for $500, you get paid $500. Nice feeling, isn’t it? However, you aren’t off the hook. But the IRS doesn’t want you to pay your taxes all at once (in April), or every time a client pays you either. Kinda like when your S.O. asks what you want to eat for dinner and you say ‘I don’t care’ but, in reality, Chipotle is your heart’s true desire. Fortunately, the IRS provides a form, called 1040-ES, to help you determine if you’re required to pay quarterly taxes and how much you’ll need to pay. You can pay your estimated taxes online. We’ve included the payment schedule below. In short, all income is taxable. Whether you’re a sole proprietor, LLC, or S-Corp, you’ll need to pay taxes on your net income, or income minus expenses. That’s why it’s important to track every, single expense. From website hosting to project management tools, knowing what is taxable, not taxable, and deductible will reduce your tax liability. The list below isn’t comprehensive, but it includes the most common types of taxable income you might have. Barter income (for example, you trade wedding photography services for a new website design. You must pay tax on the fair market value of the web design services you received). Hobby income (you can deduct your expenses from income unless it’s a hobby and you have more expenses than you do income). Need to track your income, expenses, and deductions? Learn more about our services.